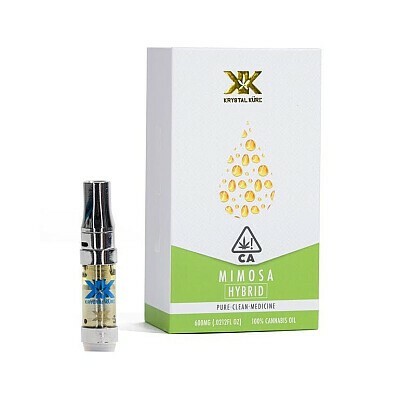 Krystal Kure's Mimosa cartridge contains nothing but our premium, solvent-free essential cannabis oil distilled from balanced hybrid strain Mimosa. Mimosa hybrid which lineage cross between clementine and purple punch. Krystal Kure's cartridges utilize a cutting-edge ceramic heating element housed inside a durable quartz cartridge. We take pride in having the strongest organic distilled wax pens that are lab tested at 90% and unlike most wax products on the market, Krystal KüRe is free of fillers and solvents such as: PG, PEG,VG or MCT.